Available in capacities from 110 lbs – 44090 lbs. Our HB Welding positioners help to put less stress on their operators, they can rotate a piece 360 degrees to reduce time and strain spent making adjustments. 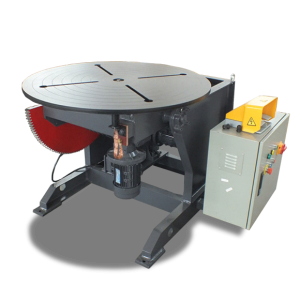 These versatile positioners are designed for an extensive range of work and can handle weight capacities from 110 lb. up to 44,000 lb. These models include variable speed that is adjustable with pendant control. It has a brush ground and adjustable limit switches and six slots in the table for securing the part to be welded. A 10 HP tilting motor feeds into two oil bath gear reducers while a 7 HP rotation motor feeds into two gear reducers. Our HB Positioner line offers a productive, safe and durable solution to everyday welding.